Sukau is located beside the lower Kinabatangan River, the longest river of Borneo. The main reason for tourist to Sukau is to go cruising Kinabatangan river to watch wildlife. Situated at Eiton Hill, this beautiful granite church was built in 1893 and took 20 years to complete. The church was constructed with granite found at Sim Sim. The Rainforest Discovery Center (RDC) situated in Sepilok, Sandakan is a part of the Kabili-Sepilok Forest Reserve. Located in Sabah, the RDC is an environmental education (EE) centre in Sabah. The RDC is a centre for environmental education situated within the famous Kabili-Sepilok Forest Reserve, home of the orang-utans of the Sepilok Orang-utan Rehabilitation Centre. Its primary function is to create public awareness and appreciation of the importance of conserving forests, as well as the sustainable use of forest resources. Take a walk through the park, or a stroll on the suspension bridge at the 950 meters canopy walk and view countless of exotic wildlife. Night walks along the trail also offer a chance to catch a glimpse of wildlife such as the cunning mouse deer, wily civet cats, cute tarsiers and various insects and birds. There are also many magnificent flowering shrubs a the Plant Discovery Garden, with about 250 species of native orchids. The orchid family, is known to be the largest flowering plants with about 25,000 wild species throughout the world. Enthusiasts, naturalists, budding scientists and nature lovers from all walks of life will get to know more of the wonders of the rainforests through this unique Rainforest Discovery Centre. The RDC helps to raise public awareness and appreciation of the importance of conserving forests, as well as the sustainable use of forest resources. Lot 5A-B & 6A-B, Block 24, Jalan Lebuh Dua Sandakan, Sabah. Lot 1,Tingkat 1 Wisma Harbour View, Sandakan, Sabah. A destination for weekly shopping of all kind of vegetables, seafood & fruits here..
On the 2nd floor are a lot of stalls selling shirts, shoes, bags & Sabah craft like crystal & pearl accessories. Sandakan Central Market has most amazing variety of seafood in Sabah, along with vegetables, spices and oils, cheap clothing and Indonesian sarongs. The busiest time is on Sunday, when it is tamu in Sandakan! In the harbor behind the market are the wooden vessels of Suluk fishermen, and those of barter traders from the Philippines. UNCLE TAN WILDLIFE ADVENTURES SDN. BHD. SEPILOK ORANG UTAN REHABILITATION CENTRE is managed by a UK organization to preserve orang utans in Borneo. Feeding time at 10am and 3pm daily. Rm10 for camera fees. 25pounds per year to adopt an orang utan. Entry fee RN30 for adults. If u missed the feeding time, u may risk not seeing any orang utan at all as the place is just like a natural forest and the orang utans may be deep in the forest. The reserves take care of the young Orang Utan, teach them survival skills and release them in the reserve. Some of them go back to feeding platform occasionally, some all the time, some never go back as they are able to find all the food they need in the wild. For those adult orang utans who can survive in the wild, they are transported by helicopter into another forest which is twice the size of Singapore. Orang utans have long fascinated mankind. Known scientifically as Pongo Pygmaeus, they have been found to be 96.4% similar to our human genes! Gentle and shy by nature, sightings of orang utan in the wild are rare. However, one place you are guaranteed of seeing them is at the Sepilok Orang Utan Rehabilitation Centre. The world's largest orang utan (Man of the Forest) sanctuary is just 40 minutes away from downtown Sandakan. To visit, take a taxi or ' Sepilok' buses from the station near Central Market in Sandakan. The Sanctuary started in 1964 for rehabilitation of orphaned baby orang utans from logging-sites, plantations and illegal hunting, returning them to the wilds as soon as they're ready. More than 4,500 hectares of virgin jungle were designated as forest reserve and sanctuary for these charming creatures. Touching these creatures is discouraged to prevent the spread of human diseases to the creatures. There are some who have grown so fond of human company that they refuse to return to the wilds. Other semi-wild orang utans come to the Sanctuary twice daily from the forest for feedings of milk and bananas. There is a minimal Conservation/Entrance fee payable at the Registration Centre. Feeding Time: 10:00 am and 3:00 pm. If you would like to stay overnight to observe these creatures further, accommodation is available outside the sanctuary. "Sandakan" is derived from the Suluk word "sanda" meaning, to pawn and "kan" being the suffix. So "Sandakan" means the place that was pawned. Who pawned it, and to whom, remains a mystery. As the story goes, in the early 1870s, William Clarke Cowie, a Scottish adventurer and engineer, delivered guns and ammunitions to the Sultan of Sulu, then protecting his territory from Spanish conquerors. (HASHEMITE SULTANATE OF SULU). In return, Cowie was granted permission by the Sultan to set up base on Pulau Timbang, in Sandakan Bay, where a small Suluk village existed. Cowie called his base "Sandakan" but it soon became known as "Kampong German" due to the number of German traders who visited Cowie. The settlement was re-located to Bull Sim Sim in 1879. It was an uninhabited jungle and mangrove area but with one of the most beautiful natural harbors in the world. He named the new settlement, "Elopura" meaning 'The Beautiful City" but the name reverted to "Sandakan". In 1883, the British North Borneo Chartered Company moved its capital from Kudat to Sandakan. A "building mania" started and Sandakan became a bustling modern town though Allied bombings to liberate it towards the end of World War 2 nearly flattened the town. In retaliation, the Japanese burnt whatever remained and Sandakan as a town, ceased to exist in June 1945. In 1946, the capital was moved to Jesselton (subsequently, renamed Kota Kinabalu). Sandakan was first and foremost a port for the export of logs and timber. In fact, it was said that Sandakan timber went into the building of Peking's Temple of Heaven. In its heyday, Sandakan used to boast of having the greatest concentration of millionaires in the world! Today, it is known more as the gateway to nature's most prolific treasures in Borneo. Sandakan's prosperity led to an influx of people. Chinese, Europeans, Malays, Dayaks, Dusuns, Sikhs, Pathans, Arabs, Filipinos, Suluks, Javanese and even Japanese. One of the earliest Chinese immigrants was Kwan Woon Kwong, a general merchant, who established the oldest company of Sandakan, the Man Woo Loong Company in 1882. Situated at Mile 1.5 Jalan Utara, this century-old temple was built around 1894. Its uniqueness lies in its "preservation of a temple within a temple" as conservation efforts had literally lifted the old temple and transferred it to within the new temple, a first in Malaysia. Situated at the edge of the town padang. The Three Saint's Temple is the oldest building in Sandakan. The three saints are Kwan Woon Cheung - saint of righteousness; the goddess of Tin Hou, worshipped by fishermen and seamen for protection, and the Min Cheong Emperor, worshipped by those who seek success in examinations (even to this day!). Four Chinese communities got together and started the temple: the Cantonese, Teochew, Hakkas and the Hainanese. In the temple is a plate inscribed with the names of all those who gave more than RM2. The bell donated by the first Kapitan Cina of Sandakan, Fung Ming Shan can still be seen in the Temple today. Situated on the hilltop above Tanah Merah, south of Sandakan town centre, the temple was built in 1987 at a cost of about RM7 million. From here, you can catch a breathtaking view of Sandakan Bay. The extravagantly ornate temple is a blaze of red and gold, with writhing dragons, gold-gilded Buddhas, hundreds of gleaming lamps and the fragrance of burning incense. It is said that the temple protects and brings good-health and wealth to Sandakan and its people. Located at Mile 8, Jalan Labuk Utara, this RM750.000 Memorial is dedicated to some 2,700 Australian prisoners of war (POWs) and others who died at the Sandakan POW camp and death marches in North Borneo during World War 2. The Memorial comprises three Memorial Caims within the Park, a Commemorative Pavilion and the Sandakan Memorial. Another link with the past can be found in Agnes Keith's house. Situated on a hill at Jalan Istana overlooking Sandakan Bay, it was the home of Conservator of Forests, Harry Keith and his American wife, Agnes Keith, a writer, from the 1930s until 1942. Agnes' book on life in pre-war Sandakan popularized the old seafarer's name for Sabah in its title, "Land Below the Wind" (referring to Sabah's location just below the typhoon belt). Her second book. Three Came Home, about their war experiences was made into a movie. Their two-storied wooden bungalow, built on a ridge overlooking the town, was destroyed during WW2 but reconstructed when the Keiths returned in 1946. Conservation and rebuilding of the house is in progress. This mosque sits on the hilltop overlooking the town centre. Its quaint architecture was designed based on a harmony of Islamic elements. Situated in Sandakan Bay, this beautiful forested island has striking, prominent cliffs at its northern end and also had a small leper settlement colony. During WW2, Berhala became the camps for civilian internees and POWs. A story was told of an escape, when eight prisoners being taken to the mainland made their break at Berhala via the leper colony. They swam to the sheer walls of the Berhala cliffs and with help from natives, escaped to freedom. Each year, some families of the Australian POWs make their pilgrimage to this seemingly peaceful island to retrace that dramatic journey. The Cemetery at Jalan Istana has a monument and the remains of Japanese soldiers who died during World War 2, plus some Japanese women who worked, lived and died in Sandakan. The Central Market is where locals come to buy fresh produce, fruits, delicacies and crafts, sarongs and seashells. The fish market here is perhaps the biggest in Sabah and offers a stunning array of fresh seafood. Other places of interest include the Crocodile Farm and Forestry Headquarters at Labuk Road and the Labuk Bay Proboscis Sanctuary, situated on a 400-acre mangrove forest inside the Yet Hing Oil Palm Plantation. Three hours' by boat and 40 km. 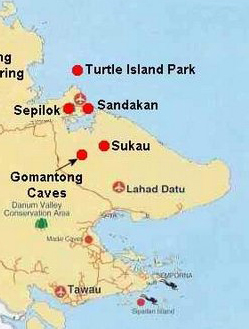 north of Sandakan in the Sulu Sea, lies Sabah's third Marine Park, one of the most important turtle breeding spots in South East Asia. Designated as a Marine Park, the islands of Selingan, Bakungan Kecil and Gulisan are safe haven for the endangered Green Turtles and Hawksbill Turtles. Strangely, these turtles only lay their eggs in their original birthplace. So after over 30 years of turtle conservation, the success is now clearly evident as more turtles make their pilgrimage every year. Dive into these waters and marvel at how the turtles are like ballerinas floating amidst the corals, foraging for food before their next breath of air. At night, crouch quietly as park rangers point out the turtle laying their eggs. It's a slow sand digging, laying and burying ritual that they go through before making their way back into the waters. Park rangers then carefully transfer 100 over odd eggs into safe haven for monitoring, before hatching and subsequent release into the sea. An overnight stay on Selingan Island is recommended for a rare glimpse of these turtles laying eggs. Arrangements can be made with local tour agents, while independent travelers may contact the number below.